Tomás Guitiérrez Alea's Memories of Underdevelopment is a startling look at the tumultuous cultural shift within Cuba after the failed Bay of Pigs invasion. Seen through the lonely eyes of star Sergio Corrieri, we follow one man's quest for personal identity as well as his country's as he struggles to figure out his place in a changing landscape. The Criterion Collection brings Memories of Underdevelopment to Blu-ray with a beautifully restored transfer, a terrific audio mix, as well as their usual assortment of quality bonus features. Recommended. Memories of Underdevelopment from Cuban filmmaker Tomás Guitiérrez Alea offers a fascinating look at a dramatic cultural shift. Set against the backdrop of the aftermath of the failed Bay of Pigs invasion, one man played by Sergio Corrieri must find his place in a country that doesn't know what it is yet. It's like watching a societal adolescence as a new culture develops adapting to new principals and ideals. Alea's fearless and honest approach to the subject allows you to see a part of a country rarely documented from within while also gaining an understanding of the political and economic shifts the undeveloped island nation experienced. Sergio (Sergio Corrieri) was a part of the rich and glamorous upper class. A writer and intellectual, he, his family, and his friends were the embodiment of the bourgeois. After the failed Bay of Pigs invasion and Castro's rule has cemented, Sergio finds himself at odds. Does he follow his friends, his brother, and wife to America and continue with the decadent life similar to the one he once enjoyed before Batista was overthrown. As Sergio wanders the streets of Havana, he examines his own life while observing the changes in his friends, culture, and the uncertain prospects of love with Elena (Daisy Granados), someone who may feel differently about the world than he does. 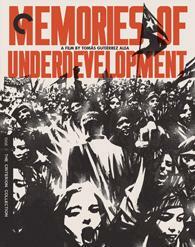 I'd come across Memories of Underdevelopment several years ago as part of a Foreign Cinema class I took in school. It was on the suggested viewing list, but I only gave it a passing glance not really taking the time to fully appreciate it. It didn't help things any that the only copy available was a rather disastrous dupe burned on a DVD-R that was barely watchable in places. To that end, I'm glad I was finally afforded this chance to sit down and fully appreciate this film because it's fascinating. I've long had a mild obsession with late 60s and early 70s politics and Cuba is a prominent piece of the puzzle during that time so it's really cool to see Cuba from within. Added to that is Alea's unflinching voice as he is openly critiquing not only the way Cuba used to be but the direction it was heading at that time. One of the most interesting aspects of the film for me was how Cuba came to appreciate art through censorship. There is a telling moment in the film where all of a sudden the film cuts to assorted film clips of women in various stages of undress or depicted in salacious scenarios. These scenes play on repeat for a few moments before the explanation is given that they were trims cut from foreign films under the Batista regime. Sergio watches these scenes in a theater with one of his political revolutionary friends as he expounds on how they're now free to experience art - dismissing the fact that Sergio himself was an intellectual writer who is effectively being censored out of a career. Thematically speaking, Memories of Underdevelopment is practically the perfect cinematic expression of adolescence. That chaotic time where you don't know what you're doing, what you believe, or where you want to end up. Sergio is experiencing this internally and externally. As his old world dissolves away and the new one rises, he's unsure of his place. He hates what led to where things are, but at the same time, he hates where they're going. He wants to be with his wife and brother who have fled to America, but he doesn't want to conform to a culture and an identity that isn't his. So the only thing left to him is to try and carve out a version of his old life within the confines and constipated expression of the new Cuba. At just over an hour and a half, the film covers a lot of ground and will require you to take a little time to absorb it. Memories of Underdevelopment is one of those where I feel like each viewer will take away something different from it based on their own personal proclivities. I'd love to say that it is the perfect film to show someone entering that tender phase of life where you're almost out of high school and just about to enter the real world. But at the same time, looking at my younger self I doubt I would have fully appreciated this film in my teens. Memories of Underdevelopment arrives on Blu-ray courtesy of The Criterion Collection with spine number 943. Pressed onto a Region A BD-50 disc, the disc is housed in a standard sturdy case. Also included is a poster/booklet containing a very good essay from author Joshua Jell-Schapiro that provides an interesting history of Cuban cinema during the Batista regime and under Castro. The disc loads directly to a static image main menu featuring traditional navigation options. As detailed in the opening of the film, the 1.66:1 1080p transfer had to undergo an extensive restoration process. Rescued from severe vinegar syndrome, the image is often immaculate with stunning clarity, natural grain, and terrific black levels and greyscale. However, periodically the irreparable damage does crop up and the image can become a bit hazier and exhibit any number of anomalies from scratches to noticeable fading. However, overall I would say this is a terrific looking film. Shot in an almost documentary style using handheld cameras, there is an authentic unscripted feel to many of the open street scenes of Havana. Details are strong, Sergio's small dour apartment is a stark contrast to the cutaway scenes of his former lavish lifestyle. Black levels are deep and inky with great shadow separation and a steady greyscale. Like I said, there are a few spots where the film just couldn't be cleaned up any better, but the image displays a terrific sense of dimension. It's lightyears beyond the terrible dark and nearly unwatchable dupe copy I briefly looked at years ago. The film is given a terrific Spanish LPCM mono track with English Subtitles. Dialogue is clean and clear throughout. Sound effects and the scoring provided are well defined with decent spacing. At times the film can sound a bit thick, but it isn't too distracting. There are a few moments of hiss and a couple pops and cracks left over, but they're minuscule moments and don't pull away from the film or cause you to miss any piece of important dialogue. Like the video transfer, considering the state it was restored from, this is a very good audio mix that lends itself well to the film. As with any great Criterion Collection release, there is a solid assortment of informative bonus features accompanying Memories of Underdevelopment. It's nice to get material that isn't only relevant to the film itself but also the era and culture it was made. Again, do give that essay from Joshua Jell-Schapiro a read, it helps give the film and bonus materials some context. Memories of Underdevelopment is a hell of a film. It not only captures the angst and turmoil of a changing political and cultural landscape, but it also serves as a cinematic time capsule. It's a peek into the lives of a people you more often hear about in the news that you encounter in everyday life. The Criterion Collection has done a terrific job restoring the image and audio for this Blu-ray release and giving it a great assort of meaningful and interesting bonus features. Recommended.